wadn’t a . . . there wadn’t a mine running or a lump of coal running nowhere. . . . T. BARTLEY: Stayed that a way for about six weeks. Figure 9.1 Mining family in Pennsylvania near the time of the 1918 epidemic. From the Stanley family records, circa 1919, privately held. CASE ANALYSIS 1. Recognize potential issues and major topics in the case. What is this case about? Underline terms or phrases that seem to be important to understanding this case. Then list 3–4 biology-related topics or issues in the case. 2. What specific questions do you have about these topics? By yourself, or better yet, in a group, list what you already know that is related to the case in the “What Do I Know?” column. List questions you would like to learn more about in the “What Do I Need to Know?” column. What Do I Know? 3. Put a check mark by 1–3 questions or issues in the “What Do I Need to Know?” list that you think are most important to explore. 4. What kinds of references or resources would help you answer or explore these questions? Identify two different resources and explain what information each resource is likely to give that will help you answer the question(s). Choose specific resources. Core Investigations I. Exploring Flu Antigens, Genetics, and Replication The transcript in the case is an oral history told by a survivor of the deadly flu pandemic (global epidemic) of 1918. It is estimated that this flu was responsible for at least 40 million deaths worldwide. Questions about the 1918 flu and why it was so deadly were unanswered for years. In 1995, scientists successfully sequenced the genome of the virus using archival autopsy tissues of known victims from 1918 (Taubenberger and Morens, 2006). The virulent human-to-human transmissible influenza of 1918 is an avian flu virus that scientists named H1N1. Less lethal descendants of H1N1 are among those causing the seasonal flu for which we get immunizations (vaccinations) each year. This investigation emphasizes Concepts 19.1, 19.2 (read Reproductive Cycles of Animal Viruses), 19.3 (read Viral Diseases in Animals and Emerging Viruses), and Table 19.1. Be sure to examine the diagram of the flu virus. Both H1N1 from 1918 and today’s closely monitored avian flu virus, H5N1, are classified as influenza A viruses. 1. What molecule does the H stand for in the name of both viruses; where is the H molecule located on the virus; and what role does the H molecule play in the life cycle of the virus? 2. What molecule does the N stand for, where is it located; and what is its function in the viral life cycle? The internal structure of influenza A flu viruses includes a matrix surrounding eight individual negative-stranded RNA molecules, each within its own capsid, that make up its viral genome. Each of the RNA strands codes for a specific protein. 3. The virus uses the host cell to produce more copies of itself. As the viral RNA replicates in the host, mutations arise much more frequently in the viral genome than in the host genome (which replicates DNA). Why do more mutations occur in the virus than in the host? In addition to mutation (antigenic drift), influenza A viruses can also exchange RNA with other strains of influenza A that may have simultaneously infected the same host cell. The RNA molecules can undergo genetic recombination, producing new strains with unique viral genomes in a process called antigenic shift. New strains of influenza A are produced continuously through both mutation and recombination, necessitating annual seasonal flu shots to prevent infection. 4. Depending on the strain, influenza A is found in a variety of animal hosts including humans, pigs, birds, cats, dogs, and even whales. Many influenza A viruses are not specific for a single kind of animal host. In the later discussion, “Pandemic Flu (Possible),” maps showing the current spread of H5N1 include the density of chicken farms and pig farms as well as human populations. Why do you think these three populations are being tracked by epidemiologists looking for new strains of avian flu? 5. Suppose a human host suffering from seasonal influenza A (readily transmitted from human to human) comes down with avian flu at the same time. What serious consequences might result? 6. The immune system responds specifically to the exact combination of the H and N surface proteins found in a flu virus particle. Currently, 16 antigenically distinct groups of H molecules and 9 distinct groups of N molecules have been identified. How many possible antigenically distinct combinations of H and N could occur? virus-laden droplets that are coughed or sneezed into the air or onto surfaces and then contact susceptible tissues. Other combinations of the H and N proteins cause flu in other species, but they cannot easily initiate disease in humans. The H5N1 “bird” flu is deadly, but it was not known to be human-tohuman transmissible at the time this book was published. When a viral hemagglutinin attaches to a specific receptor on a host cell, it initiates the process by which the virus gains entry into the host cell. Without these receptors, infection cannot occur. See Table 9.1 for differences in the receptors for H1, H2, and H3 versus H5. Receptors are host cell–surface glycoproteins that terminate in sialic acid linked to the penultimate (next to last) galactose by an alpha 2,6 linkage. Cells with these glycoproteins are common in the human upper respiratory tract (nose, upper throat). Receptors are host cell–surface glycoproteins whose terminal sialic acid is linked to the penultimate galactose by an alpha 2,3 linkage. Cells with these glycoproteins are common in bird upper respiratory tracts. Human cells having glycoproteins with the alpha 2,3 linkages are found deeper in the human respiratory tract, throat, and deeper in the lungs. Table based on information in Kuiken et al., 2006. 7. a. Explain how the location of human glycoprotein receptors for H1, H2, and H3 influenza A antigens facilitates transmission of these strains among humans. b. Explain how the location of human glycoprotein receptors for H5 influenza A antigens has contributed to the failure—so far—of this virus to be readily transmitted among humans. 8. The World Health Organization Global Influenza Programme is developing “pre-pandemic” candidate vaccines based on H5N1 viruses from infected humans. These pre-pandemic vaccines are needed for preparedness planning and are used in studies that inform dosage, cross-reactivity, and cross-protection. They are also available for governments to request for pilot vaccine production (World Health Organization, 2007). Do you think that these pre-pandemic vaccines will be effective against an H5N1 influenza that becomes human-to-human transmissible? Why or why not? 9. A new strain of H5N1 avian flu could emerge that would result in human-to-human transmission. a. Why is vaccine development not the highest priority right now? b. Once an epidemic has started, vaccine development will be a high priority. Epidemics often occur in “waves” of illness, with different segments of the population becoming ill each time. Three waves of disease, each lasting weeks, are not rare in a flu epidemic. Why does creating a vaccine in preparation for a second wave of an epidemic make the most sense? 10. Review the replication cycle for flu viruses in Chapter 19. Pharmaceutical companies wish to produce antiviral drug therapies that can interrupt the viral replication cycle while causing minimal adverse effects on the host cells. Several classes of drugs are known to interrupt influenza A replication. Oseltamivir (Tamiflu) and zanamivir (Relenza) are drugs that inhibit the action of the N protein. Oseltamivir has been used successfully in some cases but only during the first 36–48 hours postexposure. What part of viral replication is affected by these two drugs? Why is early treatment needed? 11. Resistance of avian influenza A to oseltamivir has already been observed. For example, a resistant H5N1 influenza A mutant has been isolated from a human. There was a substitution of a single amino acid at position 274, in which a tyrosine replaces histidine (deJong et al., 2005). Explain how resistance to a drug increases the fitness of the virus. II. Pandemic Flu (Possible): The Spread of H5N1 Avian Influenza Although the 1918 “Spanish flu” pandemic is long over, its lessons have been critical to understanding subsequent flu pandemics (in 1957 and 1968) as well as for preparing for future pandemics. The current H5N1 avian influenza is a different type of flu virus than those that have infected humans in the past. At the time of this publication, H5N1 has been only avian-to-human transmissible, but it is frequently deadly in the people who contract it from birds. In this investigation, you will be making observations from the maps that follow (Figure 9.2), detecting patterns, and drawing inferences about the occurrence and spread of H5N1 avian influenza. Use the maps to learn more about the H5N1 avian influenza A. 1. Examine Figure 9.2a. In 3–4 sentences, describe the general pattern of H5N1 avian flu that is shown in this map. Tell what continents and approximate latitudes are affected, where it seems to be most common in poultry, and where wild birds are the only cases reported so far. 2. Next examine Figure 9.2b. How does the density of human cases compare with the distribution of the H5N1 flu in poultry? In wild birds? 3. What inferences can you draw from these data about how avian flu is transmitted to humans? Explain each one, referring to the data you used in developing that inference. 5. Use the updated Figure 9.2b to calculate the death rate due to bird flu for Indonesia, Vietnam, China, Nigeria, and Egypt. Death rate = (number dead/total cases)  100% Round to nearest 0.1%. 6. If you were planning a trip to one of the countries listed in number 5, would you rather be told the death rate or the number of cases and deaths in each country? Explain. 7. Egypt reported its first cases of avian influenza in humans in December 2006. In the first 3 months of 2007, there were 14 more human cases of avian flu, with three deaths in that quarter year. Like people in much of the world, most Egyptian households keep small numbers of chickens. However, a tradition unique to Egypt is that its poultry are fed mouth to mouth by women who first chew grain and then blow the powdered feed into the mouths of their birds. What does this information further suggest about the ways avian influenza H5N1 spreads to humans? What additional information would you want in order to confirm your idea? in Figure 9.2c. In a few sentences, describe the patterns you see in these flyways. Include descriptors such as the degree to which they overlap, their general directional orientations, and their extent. 9. Given what you now know about the location of avian influenza and bird migration, make an inference about where you think this disease is most likely to be first detected in the United States. Explain your reasoning. 10. From which part of the world do you think avian flu came to Nigeria? Explain. 11. Extending this investigation, visit one of the many interactive maps on avian influenza. Two particularly good ones are offered by the British Broadcasting group in the United Kingdom, http://news.bbc.co.uk/1/shared/spl/hi/world/05/bird_flu_map/html/1.stm, and MSNBC, http://www.msnbc.msn.com/id/12375868/from/ET/. a. Tell which map you viewed and at least two new bits of information you learned. b. Write two questions that you are able to answer with the information on the interactive map that you could not answer with the static maps provided in this investigation. 1. Once a pathogen (a biological agent that causes disease) manages to get past an animal’s physical barriers, there is a very good chance that it will be detected by the animal’s immune system. At the molecular level, how does an animal detect the presence of a pathogen and determine that it is an intruder and nonself? 2. A single virus particle of influenza A is insufficient to initiate disease in humans. It is estimated that between 100 and 1,000 influenza A virus particles are necessary to cause the flu in an individual. A single droplet sneezed from an infected person is likely to contain sufficient virus particles to initiate the disease. Explain why a single virus particle is insufficient. To do this, describe both the barrier and the cellular mechanisms of innate immunity that could play a role in stopping viral particles from initiating and then spreading flu within a vertebrate host. A recent summary of clinical findings in people infected with the avian H5N1 influenza A showed that levels of interferons, various interleukins, tumor necrosis factor (TNF), and monocyte attractant protein were higher in patients who died than in those who survived. These strong cellular responses of the innate immune system may actually have contributed to the multiorgan failure and sepsis seen in many patients (Writing Committee of the World Health Organization, 2005). By elevating the innate immune response to dangerous levels, it appears the H5N1 avian influenza turned the host’s innate defenses against the host in some patients, resulting in several deaths. Acquired Immunity: Vertebrates Only In vertebrates, once the innate immune response fails to prevent host invasion, the acquired immune response takes over. In contrast to the more general innate immunity, acquired immunity is a response to specific pathogens. Unfortunately, it takes from several days to 2 weeks for the acquired response to be fully effective. Records from the U.S. Navy revealed that when the 1918 flu was diagnosed on any ship, the entire crew was quarantined onboard and virtually all crew members got sick. Many of the men died despite their own immune responses and medical treatment. 3. In the acquired immune response, two types of lymphocytes, B cells and T cells, are the key players. Review Concepts 43.2 and 43.3 and Figures 43.9 and 43.10. a. Compare and contrast the antigen receptors of B and T cells. b. B and T cells can only recognize antigens when they are in specific locations. Where are the antigens located that B cells can detect? c. Where are the antigens located that the two kinds of T cells can detect? Include the role of the MHC in your answer. 4. Examine Figure 43.16 and focus on the acquired immune system events following first exposure to an antigen. This was the case for the sailors, coal miners, and everyone else infected in 1918. a. How are the innate and the acquired immune systems linked? How does one system inform the other of an invasion by a foreign particle? b. In the acquired immune response, which cells undergo clonal selection once their receptors have joined with one of the antigens? c. Why is clonal selection a key event in whether the acquired immune response is successful? d. B plasma cells are effector B cells that fight off the infection differently than cytotoxic T cells do. Explain. 5. Immunization against common strains of human-to-human transmissible influenza A is needed every year because the seasonal flu mutates readily. In the case of the 1918 flu, immunization was poorly understood and not available. For a possible H5N1 pandemic, immunization will play a significant role. In the acquired immune system, how does an immunization protect a person from a disease like flu? IV. Internet Activity: Influenza in the Media The communication of biological information is an essential service for our global society. It is not unexpected that a current concern like the avian flu is frequently reported in the media, but the 1918 flu is also still in the news. In early 2007, several articles cited Sir Mark Sykes, a victim of the Spanish flu epidemic, who died at the age of 39 in a hotel room in February 1919 while attending the Paris peace conference following World War I. Because the British diplomat was buried in a sealed lead coffin, researchers were hopeful that well-preserved body samples could be obtained. 1. After the flu virus is retrieved from the diplomat’s remains, what is likely to be done with the sample? To consider how current avian flu biology is being communicated globally, you can use a search engine such as Google Image Search to look for images used to communicate with the public in countries where human cases of avian flu have been reported. 3. Choose three images that you believe are helpful in presenting bird flu facts. Record your information in the following chart. 4. What kinds of organizations produce the websites containing the media that you have listed? 5. Briefly describe the biological images used and how each relates to the avian flu—for example, a masked and gloved (to prevent viral infection) worker examining poultry (potential carriers of H5N1). 6. Which of your three media choices would be the most useful for convincing your classmates that avian flu is a real biological concern? Explain. 7. If you were asked to produce a brochure to advise a segment of the public in your country about the risks of avian flu, what group would you select as the target audience? Explain your choice. 8. What images would you include in your brochure? Why? 9. Describe at least three examples of biological information you would include for this particular group. V. Using Data to Explore Pandemic Flu (Past and Possible) A. Working with Tables and Graphs on Mortality Statistics Consider the data in Table 9.3. Adapted from Life Expectancy in the USA, 1900–98 (Noymer, 2007). 1. In 1915, a man could expect to live for_____________ years. In 1918, this dropped to __________ years. 2. Between 1917 and the onset of the influenza pandemic in 1918, both male and female life expectancy dropped __________ years. 3. Construct a graph with 1911 to 1919 on the x-axis and 0 to 60 years of age on the y-axis. Show separate male and female life expectancy lines by connecting the points plotted for each year versus expected age at death. Provide a suitable title for your graph. 4. Which is more effective at quickly conveying the impact of the 1918 influenza pandemic, the table or your graph? Why? Now look at Table 9.4. Adapted from Age-specific death rates (per 100,000), Influenza & Pneumonia, USA (Noymer, 2007). 5. Which age group had the highest number of influenza- and pneumonia-related deaths in 1917? In 1918? 6. Another way of looking at the data is to consider the specific increase in the number of influenza- and pneumonia-related deaths in one age group between 1917 and 1918. You can calculate this by dividing the number of deaths in 1918 by the number of deaths in 1917. For instance, if you look at the age group 1 year, divide the number of deaths in 1918 (4,540.9) by the number of deaths in 1917 (2,944.5). The increase in deaths during 1918 is approximately 1.5 times the 1917 deaths. How many times greater is the 1918 death total than the 1917 death total for 5- to 14- year-olds? 7. Which two age groups experienced the highest increase in the number of influenza- and pneumonia-related deaths between 1917 and 1918? a. How many times greater is the 1918 total than the 1917 total for each of these two groups? b. If you were the same age you are now, how much more likely would you have been to succumb from an influenza- or pneumonia-related death in 1918 than in 1917? 8. Scientists were puzzled why the 1918 flu resulted in increased deaths in specific age groups. What was so unexpected? Scenario 1 Consider the following simulation results (Figure 9.3) based on a hypothetical scenario in which four poultry workers from Tennessee infected with an H5N1 strain are moved to a health facility with a population of 180. Figure 9.3 Simulation results for Scenario 1 of avian influenza. 1. Is this more likely to be a strain of the virus that is transmitted only from avian to human or a strain that is transmitted from human to human? Explain. 3. All infected individuals (I) eventually become recovered individuals (R). What does this tell us about the severity of the viral disease in this model—that is, what is the mortality rate observed here? Scenario 2 This is the same hypothetical situation except that 40 people are isolated in a special ward at the facility before they can be exposed to the preceding avian influenza strain. Figure 9.4 Simulation results for Scenario 2 of avian influenza. 4. The number of infected individuals (I) on Day 20 in Scenario 2 (see Figure 9.4) is __________ as compared to the number of infected individuals (I) on Day 20 in Scenario 1 (see Figure 9.3), which is ____________________. 5. The total number of recovered individuals (R) in Scenario 2 is __________ as compared to __________ in Scenario 1. What does this tell us about the efficacy of isolation in this model? Scenario 3 In 1918, no one knew what caused influenza and vaccines were not available. Nevertheless, it was understood that coughing and sneezing contributed to the spread of the disease. At that time, Seattle public health officials required all passengers and employees of mass transit systems to wear masks (Figure 9.5). Spitting was also prohibited in many cities. Figure 9.5 Street car conductor in Seattle not allowing passengers aboard without a mask. Record held at: The National Archives. In the following simulations, let’s reduce the transmission rate to approximately 10% of its previous value once the hospital initiates mask use. Exactly when the hospital starts using masks can dramatically affect the course of the epidemic, as the graphs in Figure 9.6 through Figure 9.8 show. Figure 9.6 Simulation results for Scenario 3 of avian influenza, with masks used starting on Day 30, when the epidemic has already nearly run its course. Figure 9.7 Simulation results for Scenario 3 of avian influenza, with masks used starting on Day 20, when the epidemic is at its peak. Figure 9.8 Simulation results for Scenario 3 of avian influenza, with masks used starting on Day 10, when the epidemic is still in its growth phase. 7. Using your observations of Figures 9.6 through 9.8, defend a policy that makes wearing masks mandatory during the early days of an epidemic such as the 1918 flu. Additional Investigation VI. Pandemic Planning Although the H5N1 avian influenza A strain may not be the next virus that causes an epidemic around the globe, its severity and high mortality rate in humans have raised the level of alert. Pandemics occur somewhat regularly, and planning is ongoing. International cooperative groups are already planning responses to a flu pandemic. At the same time, planning is proceeding at national, state, and local levels. Planning for a pandemic is complex and involves the participation of many stakeholder groups that have overlapping areas of concern and expertise. A list follows of some of the concerns and issues that need to be addressed in pandemic planning—in this case, for avian influenza. Address one or more of these concerns from the perspective of one of the following stakeholder groups: public health (including CDC and WHO); medicine-pharmacology; media and public information; agriculture; local, state, and national governing bodies; department of state; consumers and taxpayers. Your instructor may ask you to write a paper, prepare an informational poster or a 30-second radio spot informing the public, conduct a simulated pandemic planning meeting, or prepare some other form of response to these issues and perspectives. VII. Open-Ended Investigations The Excel-based SIR model used in Investigation V is freely available online at http://bioquest.org/ icbl/casebook/avian. Consider developing your own scenarios (more virulent flu, different mitigation efforts, etc.) and seeing their effectiveness on the spread of disease. References deJong, Menno D., Tran Tan Thanh, Truong Huu Khanh, Vo Minh Hien, Gavin J. D. Smith, Nguyen Vinh Chau, Bach Van Cam, Phan Tu Qui, Do Quang Ha, Yi Guan, J. S. Malik Peiris, Tran Tinh Hien, and Jeremy Farrar. Oseltamivir resistance during treatment of influenza A (H5N1) infection. NEJM, 353(25):2667–672, 2005. Hawkins, Nyoka. Teamus Bartley interview, Appalachia Oral History Project, Louie B. Nunn Center for Oral History, University of Kentucky Libraries, Accession No. 87OH191 App 114. Date June 14, 1987. Kuiken, T., E. C. Holmes, J. McCauley, G. F. Rimmelzwaan, C. S. Williams, and B. T. Grenfell. Host species barriers to influenza virus infections. Science, 312(5772):394–397, 2006. Noymer, A. Raw data set: Age-specific death rates (per 100,000). Influenza and Pneumonia, USA. http://www.demog.berkeley.edu/~andrew/1918/figure1.html (accessed April 2007). Life expectancy in the USA, 1900–98. http://www.demog.berkeley.edu/randrew/1918/figure2.html (accessed April 2007). Taubenberger, J. K., and D. M. Morens. 1918 influenza: The mother of all pandemics. Emerging Infectious Diseases, on return 12(1), January 2006. Online at http://www.cdc.gov/ncidod/ EID/vol12no01/05-0979.htm. Weisstein, A. E. SIR Modeling. In Biological ESTEEM: Excel Simulations and Tools for Exploratory, Experiential Mathematics. 2007 http://bioquest.org/ESTEEM. World Health Organization. Antigenic and genetic characteristics of H5N1 viruses and candidate H5N1 vaccine viruses developed for potential use as pre-pandemic vaccines. http://www.who.int/ csr/disease/avian_influenza/guidelines/h5n1virus/en/index.html (accessed March 2007). The Writing Committee of the World Health Organization (WHO) Consultation on Human Influenza A/H5. Avian Influenza A (H5N1) infection in humans. NEJM, 353(13):1374–385, 2005. Report "CHAPTER. 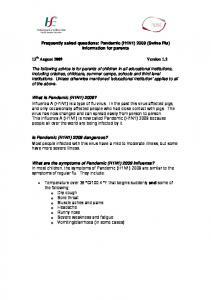 Pandemic Flu (Past and Possible)"